Michael "The Grinder" Mizrachi has just climbed to the top of this WSOPE heap, winning his second gold bracelet in two years and adding another €336,008 to his wallet. That moves him into sixth place on the all-time money list. Coming out of the big-stacked half of the bracket, Mizrachi's road to the final appeared to be a tough one, but he did what he could to make it look easy. On the very first hand of his Round-of-16 match, Grinder found pocket kings against Kent Lundmark's pocket tens, and a win there proved to be a good omen for Mizrachi. Next up for Mizrachi was a contest with Brian Hastings. 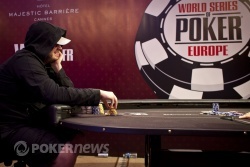 Hastings, who is more famous for his online action than his live, was in excellent form after stopping the unstoppable Erik Seidel in Round One. When the match started off both players had around half a million chips each but the Grinder was simply stunning; he won every pot of note until Hastings was reduced to moving all-in with and The Grinder called with and he was into the semi-final. In the semi-final, Mizrachi found himself up against a man very much on top of his game. Roger Hairabedian had recently battled his way through to the Partouche Main Event final table where he will try to win, a not too shabby, €1 million first prize. Hairabedian had disposed of Dimitry Motorov and Brian Powell en route to his encounter with the Grinder. Both players started with the biggest stacks of the semi-final and they both knew that the winner would carry a 2:1 chip advantage into the final, so it was a lot at stake. The match itself was slow and sedentary until the climax and a quite incredible hand. Hairabedian must have been ecstatic when he flopped a set of fives on a board, but not half as ecstatic as Mizrachi who turned a straight holding when the made an appearance. A classic cooler for Hairabedian who was out in 3rd. Onto the final and his opponent was Shawn Buchanan. Buchanan had already cashed in two WSOPE events this series and was in fine form; but he did have a 2:1 chip disadvantage. 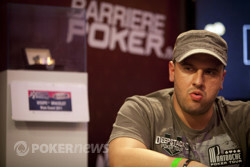 The chip difference proved to be all the difference because it enabled Mizrachi to extert pressure and exert it he did. The critical hand that sent Buchanan to the depths of despair was when the sign of the devil appeared on the flop. It was and Mizrachi extracted two-thirds of the Buchanan stack before forcing him to fold to an all-in jam on the river. 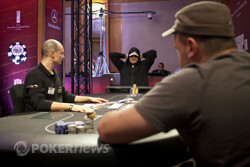 Then the final hand of Event #5 and Mizrachi added that piece of luck to his skill jigsaw. Mizrachi moved all-in over a Buchanan raise and Buchanan made the call. It was the of Mizrachi versus the of Buchanan but a in the window sealed the deal and handed Mizrachi his second WSOP bracelet. Shawn Buchanan had to settle for second place, but what a great series for him. We were fast approaching the end of Level 21 when Shawn Buchanan raised to 25,000 on the button and Michael Mizrachi mouthed those famous words, "I am all-in." "I don't want to get to the break," said Mizrachi. Buchanan thought for a while, like he does, before making the call. When the hands were turned over Buchanan was a BIG favourite to double up. Mizrachi got to his feet while Buchanan remained seated. The dealer pulled the three cards, turned them over and the shone like a beacon of light for Mizrachi. The crowd cheered and Buchanan sunk in his chair. So Buchanan needed a jack to survive or Mizrachi would win his second WSOP bracelet. So Michael Mizrachi was crowned the €10,400 No Limit Hold'em (Split-Format) Champion and Buchanan had to settle for second place in what has been a great series for the man from Vancouver. Michael Mizrachi opened to 26,000, and Shawn Buchanan flatted to see a flop. It came , and the two men checked through to the turn. Buchanan led out for 28,000, and Mizrachi called. The river paired the board with the , and Buchanan bet another 48,000. Mizrachi called. Buchanan didn't want to show, and Mizrachi went ahead and showed down his . It was just king-high, but it was good enough to take down the pot. It must be tough to be man-handled in this way but Shawn Buchanan is made of strong stuff. He has just managed to get himself three streets of much needed value. Buchanan bet 25,000 and Michael Mizrachi made the call. The flop was and Mizrachi check-called a 25,000 Buchanan bet. On the turn the dealer gave us the and it was a case of deja vu as Mizrachi once again check-called a Buchanan bet; this time for 37,000. The last car was the and it was a case of ditto-ditto as Mizrachi check-called a 73,000 Buchanen bet. "I have the ace," said Buchanan before Mizrachi's hand hit the muck. 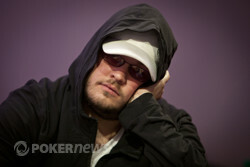 Two hands ago, Shawn Buchanan raised to 25,000, and Michael Mizrachi called to see a flop. It came , and Mizrachi check-called a bet of 26,000. They checked through the turn, and Mizrachi led out with 30,000 after the river. Buchanan quickly folded. On the next hand, Mizrachi limped in, and Buchanan knocked the table for a free flop. They check-checked until the river as the board ran , but Mizrachi put out a bet of 25,000 after a third Buchanan check. He didn't seem to like it, but Buchanan talked himself into the call. Mizrachi announced his, "Queen," showed , and scooped the pot. Things are really becoming lopsided now, and Buchanan will need to find some chips in a hurry. Michael Mizrachi is taking a hold of this thing. He has just won a lot of consecutive pots accumulating with this hand. Shawn Buchanan bet 25,000 and Michael Mizrachi made the call. The dealer in the spotlight gave us a flop of and both played rapped their knuckles on the felt. The second community card to be laid low was the and Buchanan check-called a 25,000 bet. The river was the and both players checked and Mizrachi won with a kicker contest. Buchanan showed his , now counterfeited and second-best. 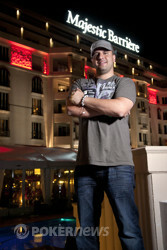 If you're been paying attention to poker for any length of time, Michael "The Grinder" Mizrachi needs no introduction. Mizrachi is a 30-year old shark from the suburbs of Miami, Florida, and he's been playing poker professionally since 2004 when he underwent a serious change in his life course. Grinder had been studying to be a doctor, but the decision to step away from secular pursuits may have been the best decision of his life. How many doctors do you know that make more than $1.5 million per year? In his seven-year career as a player, Mizrachi has earned more than $11 million, and that's good enough for seventh place on poker's all-time money list. Money is the measuring stick in this game we love, but it's the way in which Mizrachi has amassed his fortunes that's turned so many heads and put him in the discussion as one of the greatest players of all time. In 2005, Mizrachi won his first WPT title in California, and he won another one on the East Coast two years later. In 2010, Grinder snagged WSOP gold in a big way with a victory in the opening event, the $50,000 Players' Championship. More impressively, he cut through the 7,319-player Main Event a month later to secure his seat in the November Nine, eight players away from poker immortality. 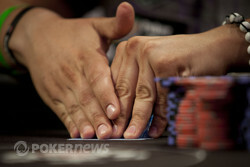 He'd go on to finish in fifth place for well over $2 million, the largest cash of his career. Like Buchanan, this is Mizrachi's 26th career WSOP cash, but it's also his thirteenth six-figure cash. Mizrachi also has four seven-figure cashes. A victory today would put him into sixth place on the all-time money list and very close to the $12-million mark in career earnings. Shawn Buchanan mulles over the Grinder's all in bet. Michael Mizrachi raised to 26,000 and Shawn Buchanan once agin three-bet to 60,000 and once again Mizrachi called. The dealer gave us the flop from straight from hell and Buchanan bet 45,000. Mizrachi wasted no time at all in grabbing four-red 25k chips and flicking them into the pot. Back on Buchanen and he made the call. The turn was the and Buchanan checked and Mizrachi made trhe biggest bet of the final so far - 250,000. Buchanan counted it out and pushed it across the line (leaving himself 650,000 behind). The final card was the and Buchanan checked again. "All in," muttered The Grinder. Buchanan went through the wringer and eventually folded his hand but it was a pivotal moment in this match up.